So depending on who you believe, this week we either had 17 or 22 people this week. I say only 17 count but Dan disagrees. Apart from the potential extra 5 that Dan is counting I don't think we had any new attendees this week but it's getting a little difficult for me to keep track. Last week Gemma said she wanted to play King of Tokyo, so as the super nice guys both Dan and I are, we'd both brought it in. I lead King of Tokyo while Dan set up Kemet. 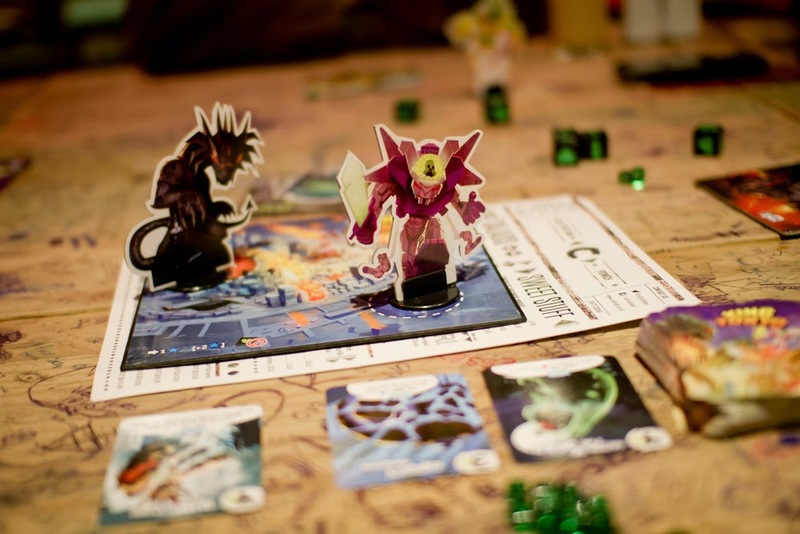 We played standard King of Tokyo without Dan's extra expansions because, to be totally honest, I couldn't remember exactly how they worked. I got taken out quickly after rolling all 6 dice three times and failing to get a single heart. I was in fact out so quickly that Dan was still teaching the rules to Kemet. I think Dan is channeling some Egyption gods because he's winning every game of Kemet he plays recently and this week was no different. Note to self: make sure we gang up on Dan next time I play. The others had lowered the usual upstanding and civilised tone of the evening by playing Cards Against Humanity. 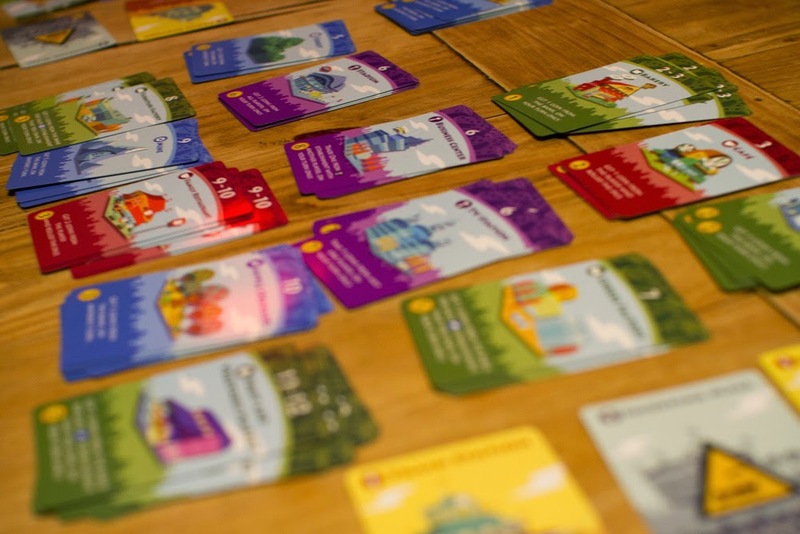 After King of Tokyo we split into two groups with one playing Splendor and the other playing Machi Koro, another dice rolling game of luck mitigation. In the same way it can go in King of Tokyo, due to no fault of his own, luck was not on Alex's side and he got left far behind. I thought I was bound to win, needing less than ten coins to buy my final landmark. The main contender to my victory was Demetri but he needed over twenty coins. I rolled a nine which would give me five coins and him ten. Instead of re-rolling I let Demetri get the ten, sure that no one else would roll another nine before his turn. How wrong I was, another ten was rolled giving us both the money required to win but his turn was before mine and my victory was stolen from me. Mike arrived at his usual 8:30 and we launched into a game of No Thanks! followed by For Sale. Contrary to last week's success, Alex continued his losing streak, coming last in For Sale. I'm pretty sure I ended up winning but I played so many games I'm having a hard time remembering who won anything..
After this we played Hanabi. I'd played this a couple of times before but always with two or three people and I'd found it fiendishly hard. 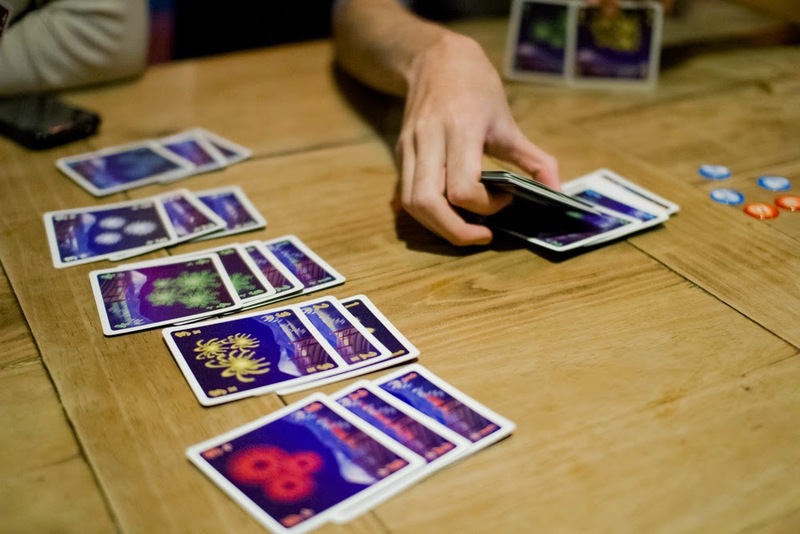 This time we were playing it with five people and found it much more enjoyable and forgiving.We actually ended up doing pretty well, playing all the cards and scoring something like 22 points but with a bit of accidental cheating when people let on more than they meant to. It's easily done in this game though. After that we joined with a few other stragglers and played a seven player game of No Thanks! Strictly more players than the game can support but we removed five cards instead of nine and started off with less tokens and it still played pretty well. I can't be sure of every game that was played this week but I know Johnny was running a game of Betrayal at House on the Hill. 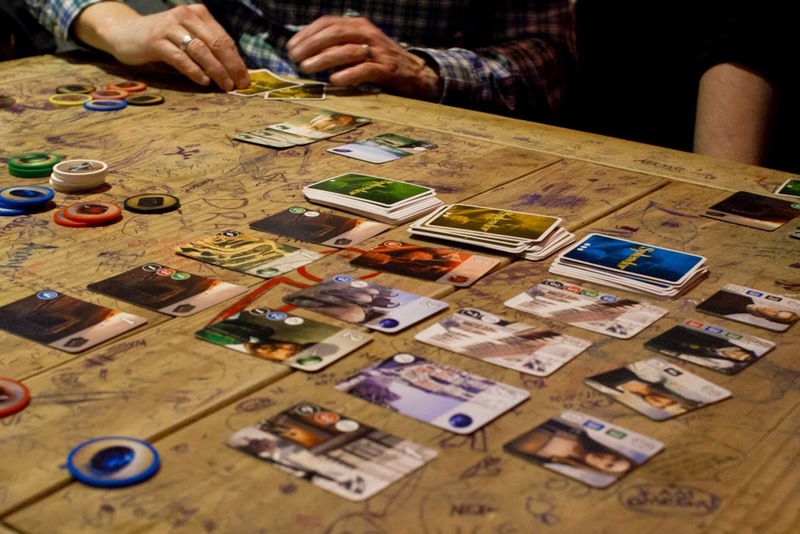 I also know Lost Legacy was played with two sets of the game in play. I know this because there was a drink related accident. Someone had split their drink all over the table, drenching Alex's cards. Luckily to avoid too much awkwardness it was James, Alex's brother, so I guess sibling rivalry dictates a series of headlocks and Chinese burns as punishment. Either that or James buys Alex new copies. I think that's probably what they're going with. This is the second drinks related accent that I'm aware of, the previous one involving my copy of Citadels but in that case the cards came off relatively unscathed. I guess we should try and make sure we put drinks on the sides, not on the tables to avoid such mishaps in the future. Finally the mystery of the extra five players. Towards the end of the night some passers by borrowed Cards Against Humanity and played that for a while with Craig. I'm not counting it because they didn't come specifically for the club, it was just a happy accident. If they're back next week to play again then I'm counting them!